Flying Monkeys Unveil Alpha-fornication: the World’s Hoppiest Beer! As part of Ontario Craft Beer Week, this Tuesday, June 21, at Gambrinus Bistro & Café in London, Ontario, the Flying Monkeys Craft Brewery is unveiling Alpha-fornication, their claim to the World’s Hoppiest Beer! 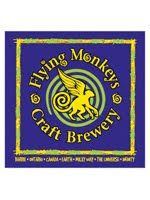 Created as part of the Flying Monkeys’ Everest Experiments, a series of extreme beers showcasing the complexity and versatility of artisan brewing, the Flying Monkeys are actively engaging the expanding minds and palates of Ontario’s craft beer drinkers.